Want to discuss these ideas about activist class cultures with a group? To help you make that happen, here's a tip sheet and a discussion guide for seven sessions, with videos and short readings to review ahead of time (and chapters of Missing Class for book groups). 1. Watch the opening video. Make agreements on ground-rules for the group. Plan upcoming sessions. Go-around: What has your class path been? Do one of the “paths” fit your story, and how do you feel about the class identity term that the flow chart gives you? How has your class experience affected your approach to social justice? 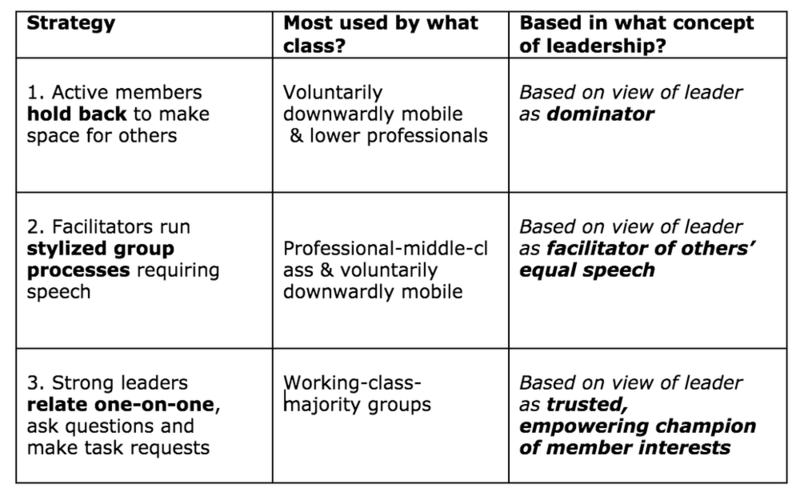 Open discussion: How do you think class differences play out in social justice groups? 1. Watch "Circling the Wagons" animated video. 2. Go over Conflict Pitfalls table below. Think about which pitfalls you've seen. Go-around: What conflicts have you seen handled well and badly in social justice groups? How did the unproductive responses match the chart or contradict it? Group discussion: Conflict always arises. How do you feel conflict should be handled in social justice groups for best results? WHICH PITFALLS HAVE YOU SEEN? Diversity ironies; What would class-inclusive anti-racism look like? 1. Watch "Diversity Ironies" animation (below). 3. Go over Diversity Ironies table (below) and think about which approaches to racism you've encountered. • In the left column, list any experiences of diversity workshops and other awareness-raising events on racism and/or other oppressions (excluding school courses); if you know the education levels and occupations of the educators or facilitators and the partiicpants, note that here too. 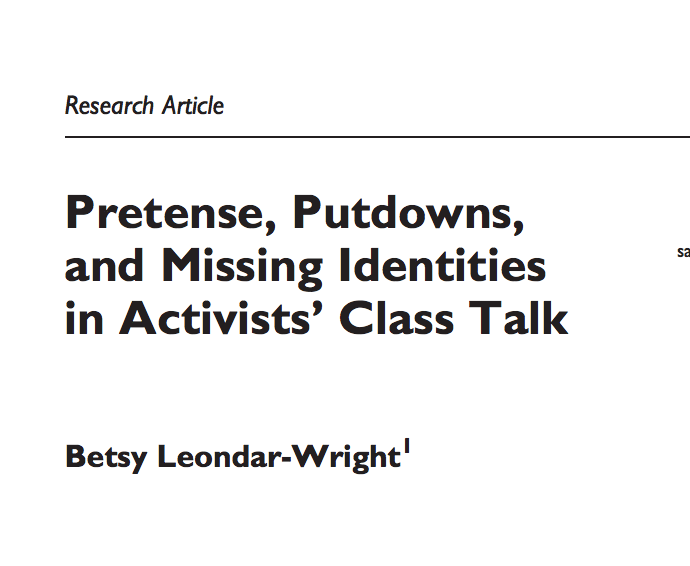 • In the right column, based on the “class-inclusive anti-racism” article and based on what you now know about class culture differences in speech styles, group process preferences, approaches to conflict, etc., characterize those workshops and event by their predominant class culture. 2. Pairs: take turns sharing what you wrote in your columns, or why it was hard to fill them in. 3. Whole group discussion: Do the experiences of group members mainly confirm or contradict Class Action’s belief that today’s ways of consciousness-raising about racism are permeated with college-educated people’s class culture? What do you think more class-inclusive anti-racism education would look like? Read article: "What would Class-Inclusive Anti-Racism look like?" which approaches to racism have you encountered? 1. Read about the winners of the Cross-Class Bridge Builder Awards, nominated and voted by people in their local areas. Think about what cross-class organizations you've been impressed by. 2. Watch video of Laura Flanders interviewing Betsy Leondar-Wright. What local organization(s) would you nominate for the Cross-Class Bridge Builder Award? What support can you give the organization(s)? What are your action steps to apply what you’ve learned in this Discussion Group? Write privately, then share in pairs; consider setting up accountability check-ins with your pair buddy. Share individual action steps and discuss. Is this group now over, or are you making plans to continue? Plan - or thank each other and say farewell. Think about what cross-class organizations you've been impressed by. Persistent poverty: Less than high school education; relying on public assistance or erratic low-paid work outside mainstream labor market; so low-income that basic needs unmet; public or substandard housing or homeless. Working class: High school degree and sometimes vocational education; supervised wage jobs or hands-on small business; renting or modest homeownership. Professional-middle class: 4-year college degree or more; professional/managerial jobs with relatively more autonomy and often higher income and security; homeownership trading up to bigger homes. Owning class – Enough assets and investment income that paid work is not essential between ages 22 and 65; elite private schools and colleges; often multiple homes or luxury homes. Voluntarily downwardly mobile: From professional-middle-class or upper-middle-class background, college degree, then choices not to pursue professional career due to political, artistic or environmental values. Involuntarily downwardly mobile: From professional-middle-class or upper-middle-class background, impacted by health crises and disabilities, addictions, crashed economy, war or other traumas, so in poverty or working class as an adult. Mixed class: Many people have complicated stories that don’t fit into one of these categories. Throughout this site, class paths are marked with colors. Class: relative rank in terms of income, wealth, education, status, and/or power. Classism: the institutional, cultural, and individual practices and beliefs that assign different value to people according to their class; and the economic system that creates excessive inequality and causes basic human needs to go unmet. Classism is woven together with racism and other systems of inequality.